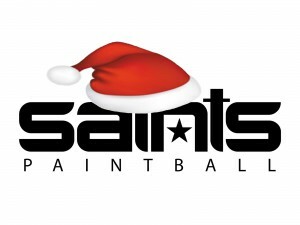 From all of us at Saints Paintball, we’d like to wish you and yours a warm and wonderful Christmas season. All jerseys, pants, and t-shirts are 30% off! Sale goes until all remaining apparel is sold. *Quantities are limited to stock on hand. Pads and under-armor excluded. Today through Jan. 1st same day rentals are $14.99 (includes: gun, mask, tank, hopper and 500 rounds of paintballs). Take your family! Take your friends! Heck, take the guy that’s dating your little sister! You know you’ve always wanted to shoot him. Let 2011 go out with a bang!